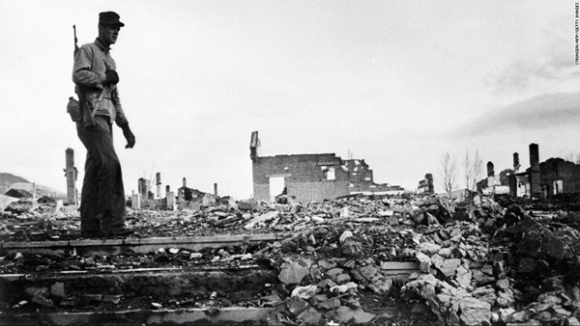 A US soldier walks across Hamhung, North Korea, rubblized by carpet bombing in an undated photo. The US public wants to know why North Korea is so paranoid, militarily hostile and boastful—and why its leaders in Pyongyang point their fingers at the United States every time they test another rocket or bomb. 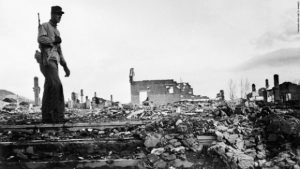 Sixty five years ago, according to US Air Force General Curtis LeMay, “We burned down every town in North Korea and South Korea, too.” Today, the Pentagon is simultaneously bombing or rocketing seven different non-nuclear countries. On August 21, just as it does twice a year, some 17,500 US military personnel, with thousands of South Korean troops launched massive joint war games off the North’s coast, exercises that rehearse an invasion of the North where the two historical bookmarks cannot be considered separately. The US regularly tests long-range ballistic nuclear missiles from Vandenberg Air Base, weapons that can obliterate the capital Pyongyang. On Aug. 31, the US flew two nuclear-capable B1 bombers near the demilitarized zone, accompanied by South Korea fighter jet bombers. Presidential administra­tions have routinely called North Korea “evil,” and a “state sponsor of terrorism.” US military officials call the tiny country a principle threat to US secu­rity. In 2002, according to Korean Policy Institute fellow Hyun Lee writing in the Summer 2017 Korean Quarterly, President G.W. Bush listed North Korea with seven countries that are potential targets of a pre-emptive US nuclear attack. Neer reports that more bombs were dropped on Korea than in the whole of the Pacific theater during World War II—635,000 tons, versus 503,000 tons. “Pyongyang, a city of half a million people before 1950, was said to have had only two buildings left intact,” according to Neer. 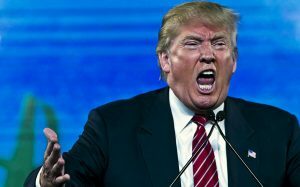 Donald Trump denounced North Korea and its president Kim Jong-un as “depraved” before the United Nations Sept. 19, saying the nation “threatens the entire world with unthinkable loss of life.” Of course North Korea can barely feed itself, and yet has to defend itself against an onslaught of Western hostility, UN sanctions, and ongoing US/South Korean war games which are rehearsals for an invasion of the North. It tests rockets and bombs to be sure, just as the US and its allies and adversaries do all year round. It’s big business. Trump asserted that, “[I]f the United States is forced to defend itself or its allies, we will have no choice but to totally destroy North Korea.” Here is Trump in a nutshell: Condemning threats of “unthinkable loss of life” in one sentence, then making precisely the same threat in the next. Perhaps Trump knows nothing about the Korean War, but the idea that the United States might “have no choice” but to totally destroy an entire country is not just a deliberate lie and an outrage, it is intended to prepare the population to get comfortable with bloodlust and atrocities, and intended to teach children to embrace them as well. 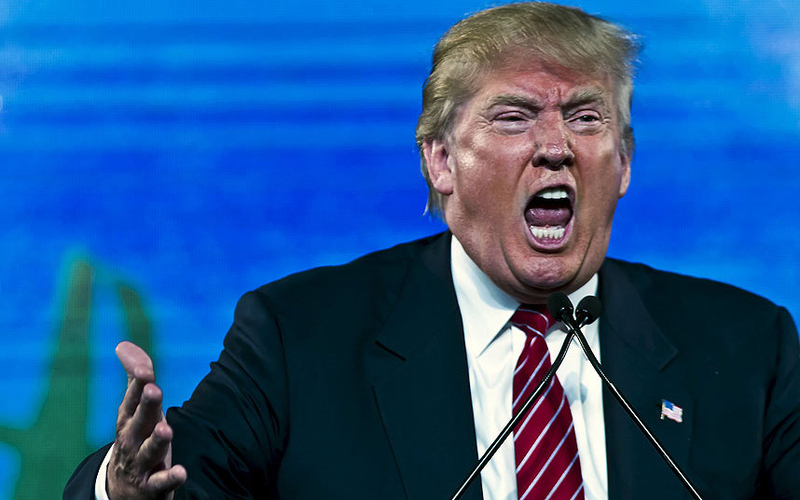 Governments always have a choice about whether to begin bombing, and since North Korea has done absolutely nothing against the United States or its allies, Trump’s hate-filled spittle about total war is all the more monstrous. Delivered before the world’s largest peace group, Trump’s ghastly threat was a barbaric embrace of genocidal violence. Trump must have for a moment believed that to “totally destroy North Korea” is a “thinkable loss of life,” as opposed to the “unthinkable” sort that he condemned. But if he did, — a big “if,” since Trump seems not to think that words have meaning, — then it is Trump himself who is depraved. He must be ostracized, stigmatized and shamed into resigning so his Administration of Hate can be replaced. Trump used the word “sovereignty” 21 times in his speech. The United States is devoted so convincingly to national sovereignty that it has maintained military occupations and shooting wars inside Afghanistan and Iraq for a combined total of 30 years and counting, and is simultaneously making war on five other sovereign states in the region. Add to the historical list of the attacked: Yugoslavia, Serbia, Iran, Bosnia, Somalia, Kuwait, Panama, Nicaragua, El Salvador, Grenada, Lebanon, Cambodia, Vietnam, Laos, Peru, Dominican Republic, Cuba, Guatemala, and of course Korea. Not a single UN delegate was aware of the president’s deceit or hypocrisy, which explains the roaring applause in the General Assembly during Trumps bomb threats. 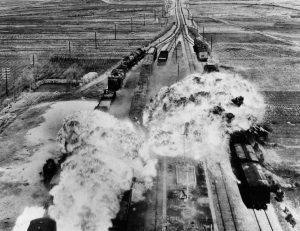 U.S. Air Force attacking railroads south of Wonsan on the eastern coast of North Korea during Korean War. Editor’s Note: In the context of a broader discussion, M.I.T. Professor Emeritus Noam Chomsky, speaking in April in Cambridge, Massachusetts, was asked by Democracy Now news anchor Amy Goodman: “Do you think there is a possibility that the US would at­tack North Korea?” Chomsky’s answer is instructive in view of the ongoing US/South Korean wargames off the Korean coast which now involve two US air­craft carrier battle groups. Noam Chomsky: I doubt it very much. The reason is very simple. An attack on North Korea would unleash … a massive artillery bombardment of Seoul, the big­gest city in South Korea and right near the border, which would wipe it out including plenty of Ameri­can troops. As far as I can see, there is no defense against that. Furthermore, North Korea could retaliate against American bases in the region where there are plenty of US soldiers. They’d be devastated; North Korea would be finished; so would much of the region. But if attacked, presumably they would respond, very likely. In fact the responses might be automatic. [National Security Advisor, General Herbert Ray­mond] McMaster at least, and [Secretary of De­fense, General James] Mattis understand this. How much influence they have, we don’t know. So I think an attack is unlikely. But the real question is: Is there a way of dealing with the problem? There are a lot of proposals. Sanctions. A big new missile defense system—which is a major threat to China and will increase tensions there. Military threats of various kinds. Sending an aircraft carrier, the [USS Carl] Vinson to North Korea…. Those are the kind of proposals as to how to solve it. So, one proposal is to accept their offer to do that. It sounds simple. They have made a proposal—China and North Korea—have proposed to freeze the North Korean missile and nuclear weapons sys­tems and the US instantly rejected it. And you can’t blame that on Trump. Obama did the same thing. A couple of years ago the same offer was presented, I think it was 2015, the Obama administration in­stantly rejected it. I really urge people who haven’t done it to read the official American military histories, the Air Quarterly Review, the military histories describing this. They describe it very vividly and accurately. They say there just weren’t any targets left. So what could we do? Well, we decided to attack the dams, the huge dams—a major war crime. People were hanged for it at Nuremberg, but put that aside. And then comes an ecstatic, gleeful description of the bombing of the dams and the huge flow of water which was wiping out valleys and destroying the rice crop, “upon which Asians depend for surviv­al”—lots of racist comments—but all with exalta­tion and glee. You really have to read it to appreciate it. The North Koreans don’t have to bother reading it. They lived it. A delivery system is needed to get a warhead to its target. An ICBM would be capable of reaching the other country’s territory. Also, zero combatants were killed.